In 2007, grocery store chain Wild Oats was bought out by Whole Foods, and since the Wild Oats Hillsdale location was much too small for a Whole Foods store (also known as "Whole Paycheck"), a local food co-op called Food Front moved in. For the past year or two, I've wanted to join a co-op, and now there is a decent sized co-op close to our house. I'd been planning to join, but today when I drove past, I noticed it was open for business! I pulled in and took the kids inside to have a look around. I was impressed. I realized I could do all our grocery shopping here, so I picked up a few items and joined. It's a good feeling to walk in with your own produce, bulk, and grocery bags, and leave the store with more food in your reusable bags than food that is packaged. Speaking of reducing packaging when grocery shopping, we're at the end of week three of our first attempt at one garbage can a month, and it still isn't full! The changes we've made are simple, and require some commitment and discipline, but over the course of a lifetime the benefits to our health and to the environment will far outweigh the inconveniences. At Food Front Co-op, located at NW Thurman (since 1972), and now Hillsdale, you can pay the owner share of $150.00 up front, or you can make $5.00 or more payments each month until you reach $150.00. If at any time you change your mind, your owner share is fully refunded to you, and whether you pay up front or make payments, you owner benefits begin immediately. There are many benefits to being an owner in a co-op, but to me, the biggest benefits will be eating locally grown food, eating seasonally, supporting sustainability, and shopping with a clear conscience, knowing that the meat and fish sold in the store are harvested in environmentally friendly and humane ways. As an owner, you get dividends from profits at the end of the year, benefits with community partners, and four owner appreciation discount days (5-10%) four times a year. 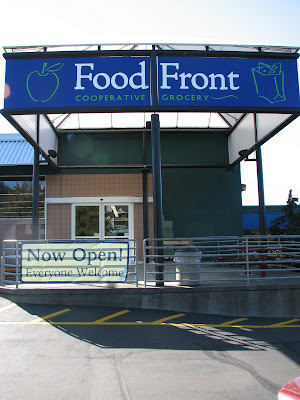 Read more about Food Front and owner and community benefits on their website, and to learn more about food co-ops in general and to see locations of other co-ops in Portland, go to the National Cooperative Grocers Association.